The Edmonton Downtown Business Association's annual Downtown Dining Week is celebrating it's 10th year and running from March 15-24! As an annual tradition, restaurants in the heart of our city put together special prix fixe menus to showcase the culinary talent in "The Dining District". Tonight I was lucky enough to attend the opening reception tonight to kick off the 10 days of eating. 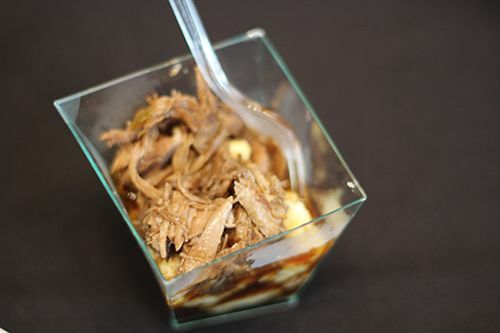 Seven restaurants were in attendance, and I got to get a sneak peek of whats going to be on the menus! Appetizers from Riverside Bistro in the Courtyard by Mariott, available on the dinner menus. 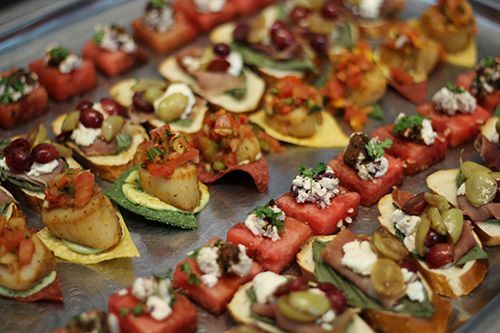 Watermelon & feta, Blackened sea scallop with guacamole & a tortilla chip, and grape bruschetta with prosciutto. I loved the grape bruschetta - it was so different and refreshing! 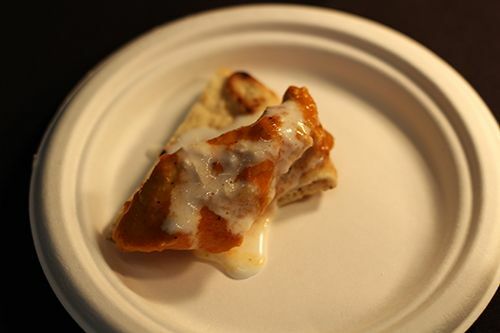 Butter chicken from Cocoa's Restaurant and Lounge in the Delta Suites hotel, available on the lunch menu. The sauce was well seasoned and the chicken tender and flavorful. Red wine braised lamb shank with thyme and goat cheese soft polenta, from Sorrentino's Downtown. The lamb was tender and juicy with the aid of the red wine jus, without noticeable game flavour. The soft polenta was a great pairing with the dish, and I would definitely order this off their dinner menu! 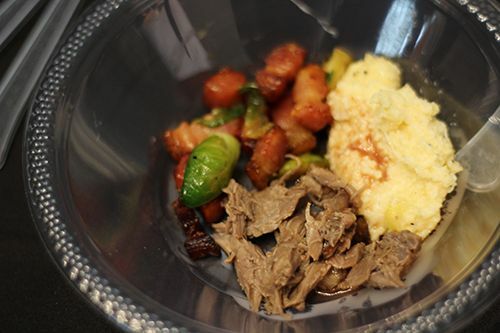 Braised lamb shank with parmesan polenta, brussels sprouts with bacon, and sour cherry demi glace from The Public House, available for dinner. I was surprised to see that 2 of the 7 featured restaurants had made such similar dishes, but the flavours were quite different. I found the lamb to be less flavourful than Sorrentino's, but I loved the addition of thickly cut bacon chunks and the brussels sprouts. I usually hate brussels sprouts, but these ones were delicious! 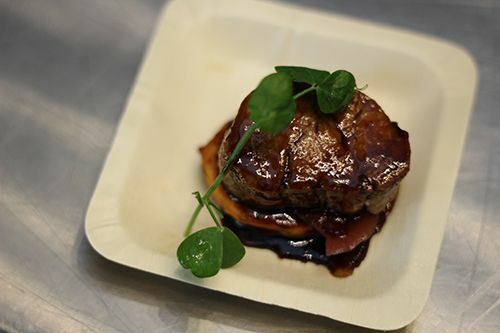 Pan seared pork medallion with yam macaire, and cinnamon maple demi glace from ZINC, available on the dinner menu. If I had to choose a favourite for the night, this would be it. The pork was savoury and so tender, while the sweetness of the yam and demi glace balanced it out perfectly. This version had some onions with it, adding a tangy kick - absolutely delicious. 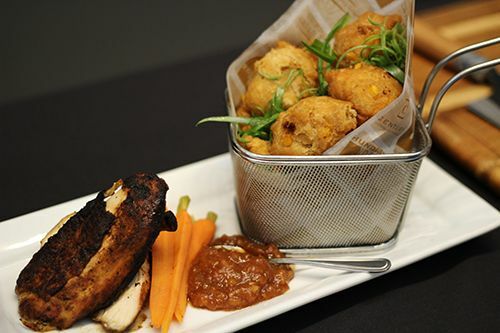 Chicken & Fritters from Hundred Bar | Kitchen, available on the dinner menu. The fritters were a close runner up for me tonight at the event, as they were served with a bacon butter and peach jam. A perfect combination of sweet, salty, smoky, encased within a golden shell. Mmm. 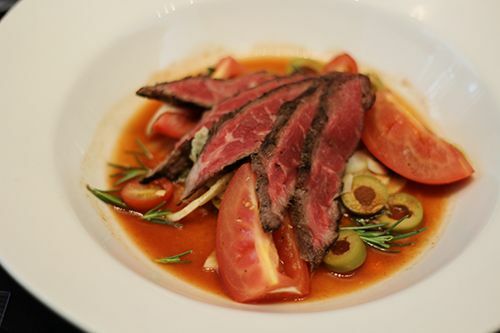 Heritage Angus beef salad with olives, pickled celery, cherry + roma tomatoes, shaved fennel, rosemary & bloody mary vinaigrette from LUX Steakhouse + Bar, available for lunch. Unfortunately, this one just didn't do it for me. While the beef was cooked medium rare and very tender, and the crunch from the veggies was nice, the seasoning was too strong for my liking, and there was too much going on. With 30 different restaurants featuring two course lunch menus for $15 and three course dinner menus for $25 and $50, there's definitely something out there for everyone. And to celebrate the 10th anniversary, all dining patrons can enter to win gift certificates to participating restaurants, and a grand prize draw for 50 bottles of Wine from DeVine Wines, plus a 35-bottle Whirlpool wine cooler! How fun is that?! I know I'm going to be out two or three times next week.. if only my stomach could handle more! Take a look at the menus here! Are you planning to try some of the menus? Let me know if you go out to eat! Lamb twice? My kind of night! The food looks delicious! Your always eating such good food. 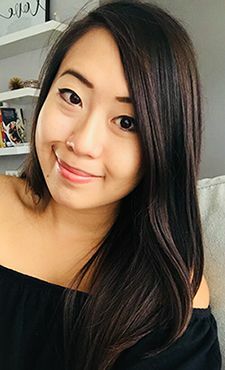 I think I need to visit Edmonton now!